We know you love your dog, but that doesn't mean you love all of their behaviors! Just got a puppy, have your hands full, and don't know where to begin? Are you afraid to leave your dog home alone because he barks, whines, or gets destructive when you are away? Does your dog act unpredictably, are they afraid, or do they go "crazy" when they see other dogs or people? At A Canine Affinity we believe that there are many different ways to achieve the behaviors you’d like to see out of your canine companions. No two dogs are alike and no two training programs will be the same. However, we strongly believe that methods proven in scientific research based on using positive reinforcement to teach the dog how to affect the consequences of their behavior are typically the most effective, least stressful and most fun for both dog and owner! These consequences can include: food rewards, play, toys, praise and constant feedback, life rewards or whatever your dog finds most reinforcing. This combined with consistency and basic home management is the key to success in any training program. We want to help you learn to effectively communicate with your dog so you can better understand how to help them become the dog you’d like to live with. We also want to help you accept the dog you have! To help you find their strengths and help them flourish. To help you find their weaknesses and help them improve to the best of their ability. Melissa is a Certified Professional Dog Trainer (CPDT-KA), A Certified Separation Anxiety Trainer (CSAT), a member of Pet Professional Guild (PPG) and the Association of Professional Dog Trainers (APDT). She is a graduate of The Academy of Dog Behavior, where she worked closely with renowned trainer and behavior expert, Trish King, for two years. She works closely with the Humane Society Silicon Valley (HSSV), where she is often called upon to help newly adopted dogs settle into their homes or help resolve behavior problems to ensure pets stay in their homes. Melissa is focused on Early Puppy Socialization and Training and founded the highly successful “Sunday Puppy Socials” at HSSV to help new puppy parents learn about the importance of teaching life skills and helping puppies develop confidence in a safe and controlled manner. She also specializes in treating Separation Anxiety and separation related problems in dogs. For more information about Melissa click HERE. Let Us Help, We're Experts! We know you want the best for your new puppy. We also know that life gets busy or you may just not know how to go about properly socializing your new puppy, so they grow up strong of mind and body. Let us help with setting up your home so your puppy doesn’t get into too much trouble while learning the rules, get you started on the path to success with potty training, home alone training, begin to teach basic manners, and impulse control that will lead to a well-behaved, confident adult dog! Worried that your puppy isn’t fully vaccinated? We know that there is concern about disease and keeping your puppy safe is our biggest priority! We take level of vaccination into account for all adventures; we will discuss this in full with you at your consultation. Common puppy “problems” we cover are: house-training, chewing, mouthing and biting, barking, crate and confinement training, and more. Additionally we teach “life skills” that will help your puppy learn to live in your busy human world peacefully. Skills like the basics of sit, down, and come. Also, more complex skills like settling on their bed or mat while you work or eat dinner, leaving alone tempting household items and icky things on the street, or dropping them easily when the temptation is just too much. This is all done with the use of positive, reward based methods backed by scientific research and a strong history of success! Choose a package that best fits your needs or set up a consultation and we can help you assess your needs! Includes a 90 min consultation where we will help you get your home puppy-proofed and set up for success as well as discuss goals for your puppy’s future! Then, 6 one-hour sessions with you and your puppy where we will go on adventures in your home and out-and-about, as well as starting them on the right paw with basic manners. You will learn how to read your puppy’s body language and help them create positive associations to new people, places, and things! A great way to start! Includes a 90 min consultation where we will help you get your home puppy-proofed and set up for success as well as discuss goals for your puppy’s future! Then, for 6 one-and-a-half-hour sessions and 2 one-hour "show off" sessions we will come to your home while you are at work, busy with the kids, or generally living life, to ensure your puppy is getting the socialization they need and starting off on the right paw with training! We will take them out for adventures and make sure they know what is and what isn’t safe in your home. After your puppy package is complete, the training doesn’t need to end! We offer multiple packages and sessions to fit your family’s needs. We at A Canine Affinity love all things puppy! We are experts when it comes to the developmental needs of puppies which includes critical early socialization. What is Critical Early Socialization? Well, from about 6 weeks to 5 months of age, puppies are in a critical socialization period where they need to be exposed to loads of new things. This includes lots of people, other animals, environmental stimuli, tactile surfaces, sounds, body handling and more. Many people don’t understand the importance of socialization at this early age as it applies to prevention of aggression and fearful behavior in the future. As we carefully expose our puppies with positive experiences to new things during this time period, their brains actually grow, creating new links to their cerebral cortex, the portion of the brain that creates learning, memory, and perceptual awareness. Exposure to the most positive experiences will create the most “links” to this portion of the brain helping them to become confident, happy, well socialized adult dogs! But if you wait too long, those links can no longer be created, and it becomes more difficult for your puppy to create positive associations to new experiences potentially causing fearful behavior in adulthood. Learn more about the importance of early puppy socialization from the American Veterinary Society of Animal Behavior. We want to help you understand, and solve, problems so you and your dog can live your best life. Behavior Problems like barking and lunging at other dogs and people on leash, barking at guests when they come to the door, or acting aggressively when you come near their food/toys or other coveted objects are often rooted in over-arousal, anxiety, or fear. Behavior modification and training based in positive reinforcement will help to build confidence in your dog, teach more appropriate alternatives and help bridge the gap between dog and human by helping you understand why your dog is behaving this way to begin with. During the initial consultation, we will take a history of your dog and their behavior, answer any questions you may have, and write up a training plan for the future based on your goals. From there, we set up a plan. You are able to pay and book all of your own appointments online through a personalized portal. The While You’re Away option is versatile and can be designed to fit you and your family’s needs. We come to your home a set number of times a week, while you are at work, busy with the kids, or generally living life, to work with your dog on your customized training plan. Then, about once a week, we meet with you for a “show off session” where your dog can show off the new skills he has been learning and you learn how to maintain those skills while we aren’t there. We lay the foundation you may not have time to, leaving you with the skills to manage your newly trained dog. While You’re Away can be a great option for dogs who may need more intensive work on a behavioral issue than single private training sessions have to offer. Some common Behavior Modification issues we handle are: Leash Reactivity (barking/lunging on leash), Resource Guarding, and Fear-based behaviors such as fear of new people/places/things in and out of the home, or Noise Sensitivity. *Please note that we are not currently accepting dog to human aggression cases. Are you afraid to leave your dog home alone? Do you feel trapped in your home? Do you worry constantly when your away from home? Do you think your dog might be suffering when home alone? Does your dog bark or whine excessively, display destructive behavior (especially around doors or windows), have accidents in the house, pace, drool or more while you are away? If so, your dog might be suffering from Separation Anxiety. Separation Anxiety in dogs is an unfortunate disorder affecting millions of dogs and the people who care for them. It is a panic disorder, where your dog feels anxious, afraid, and out of control when left alone. My separation anxiety treatment protocol offers freedom, peace of mind and long-term results from this heartbreaking disorder. Through unique and intensive training, I am able to work with you and your dog personally every day (via remote sessions conducted online), to help you accomplish your goals and regain your life! 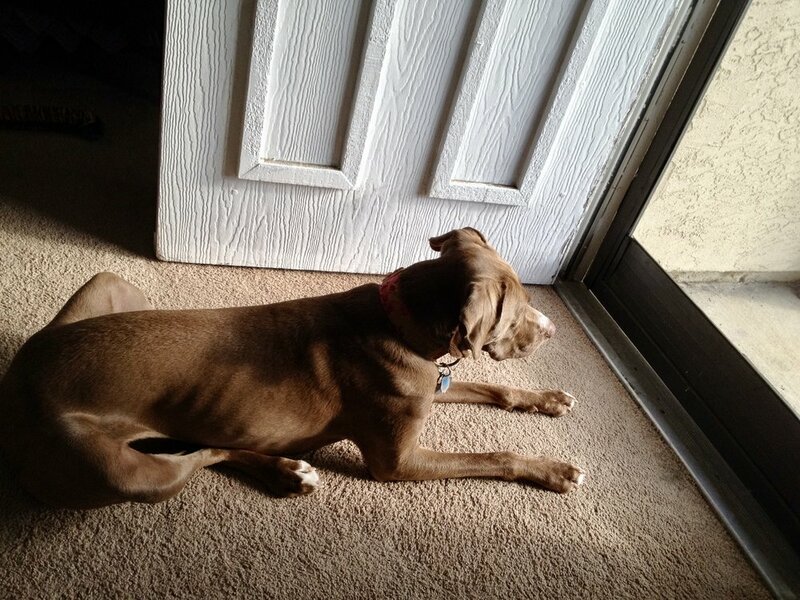 A live, remote assessment, where I observe your dog’s behavior during an actual absence. A personalized training plan created for you and your dog, based on your dog’s behavior during the assessment. Daily, personalized, easy to understand exercises to begin to resolve Separation Anxiety. Weekly face to face check in’s. All meetings and training sessions are done remotely via easy to use technology such as Skype, Zoom, or Facetime along with Google Docs. Not tech savvy? Don’t worry, it’s easy. I’ll walk you through it. An initial minimum 4-week commitment from you is required. To get started fill out the Separation Anxiety Questionnaire below and we will contact you to schedule your phone call! Melissa has earned her “Certified Separation Anxiety Trainer” credentials; the highest qualification available to treat Separation Anxiety. 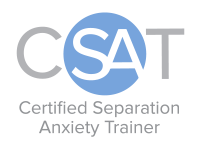 Melissa is one of only 64 “CSAT” trainers worldwide, trained by the internationally recognized Separation Anxiety trainer, Malena DeMartini, in a program only accepting a small number of highly qualified and experienced trainers each year. Our service area borders are Sunnyvale and San Jose to the north, Los Gatos and San Jose to the south (and everywhere in between). Please tell us a bit about your dog and how we can help. Thank you for your submission. We'll be in touch soon. Be sure to check your Spam folder so you don't miss our reply! If you are not seeing our Facebook, Instagram, or Yelp buttons and are using AdBlock software, please add us to your whitelist! Some photos courtesy Flickr under Creative Commons License.